The Hartwood 12′ x 8′ FSC Overlap Apex Workshop is one very large and impressive workshop that is offering you just an immense amount of space to make use of. 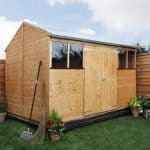 Its vast size makes this something that would work well as a DIY workshop, art studio or even a games room of some kind. 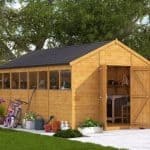 Also if you have a ton of tools, gardening equipment and other items, then this provides you with all the space you could possibly need to keep them stored safely and out of the rain so it would even work well as a general storage shed. The workshop is very impressive as it has a classic and rustic design, but it is also made incredibly well, so well that you will easily be able to make use of this for over 20 years. The cladding which has a very sturdy look to it, is 8 mm thick overlap cladding that has been designed to not just look good, but also keep the rain and the wind out. This cladding is attached to the frame in a very clever way which results in the workshop being very robust. 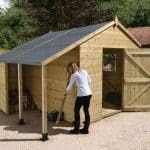 The long and eye catching apex roof will prevent rain from sitting on the roof and it has also been designed to make the rain run off at the sides, not the front. As one of the larger workshops we have seen, the Hartwood 12′ x 8′ FSC Overlap Apex Workshop really is the impressive sight. It is so large that as well as being a place that would make an awesome workshop, storage space it is so large that you could fit a bed in here and have a place to sleep when you get on the wrong side of your other half. Seriously no matter what you decide to use this for, you are going to have just an incredible amount of space to do it in. The width of the workshop is 8 feet 6 inches and the depth is a phenomenal 12 feet 1 inch. The height of the workshop is just ideal as along that long ridge, you have 7 feet of headroom while at the eaves the height is 5 feet 6 inches which is right around what we would expect. For a workshop of this size an apex roof is the only way to go and we are very pleased with the apex roof that sits on top of here. The rain will always run off at the sides which is nice and as it is made with solid sheet boarding it will not be too hard to install as it is rather lightweight, but it is also strong so even a heavy covering of snow will be no problem. Protecting the boards from Mother Nature’s bad moods is some high quality sand felt. When it comes to a large workshop we always like it to have a rather rough and rustic kind of design and the overlap cladding that they have used really does give this an old timey workshop kind of vibe and we really do like this. The cladding is 8 mm thick and with its overlap design as well as being strong it is also not going to allow water inside. With this being a big workshop it clearly needs a strong frame inside of it and they have not disappointed in this regard at all. The frame is an impressive 46 mm x 28 mm and that makes this one very strong workshop. The frame really will ensure that the workshop keeps its shape and stays firm for many years. It is so strong that you could probably run some kind of wrestling organisation in here and the workshop will be able to take that kind of abuse. The solid sheet boarding floor is able to handle lots of weight. So if you do have this as a workshop and you have a bunch of heavy power tools then they will be more than safe in here. Also for those of you who like to hoard stuff and need a good amount of space then this floor is going to be able to handle the weight of lots and lots of items. For a structure of this type, honestly we could not have picked a better type of flooring ourselves. We are sure that you are going to love the rough and ready look that this has and will not want any form of rot and decay making it look bad. So to avoid this you will have to coat the workshop with wood treatment within a week or two of installation. Once a year a brand new coating should be applied so that the workshop stays rot free. We know with the size of this, treating it may take a while, but just have some good music on and you can make it a fun experience. 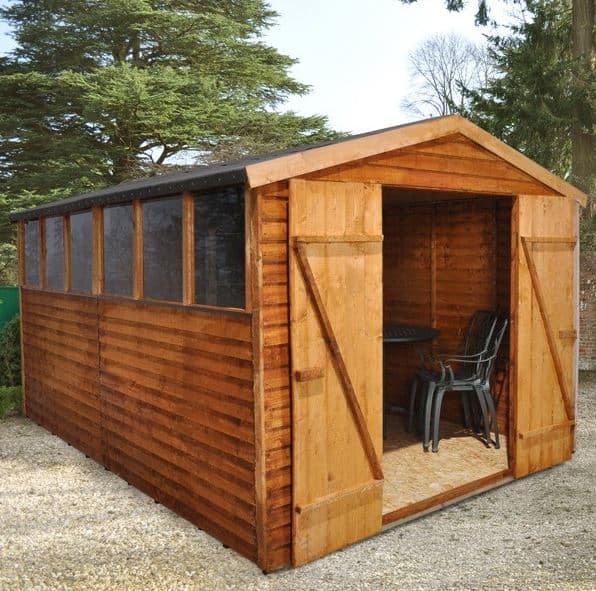 The Hartwood 12′ x 8′ FSC Overlap Apex Workshop will be covered with a ten year guarantee that will look after you as long as you treat the wood on an annual basis. The doors offer you a lot of room to get things in and out of the workshop which is something we really like to see as we are sure that no one on the planet likes having to play a game of Tetris with a table as they have to rotate it to get it through a single door. These double doors as well as being very wide and high are also incredibly well made as they have been supported with ‘z’ braces and a top quality set of hinges. Six small windows are on one side of the workshop so natural light is going to be able to get in here very well. These are small windows and made from 1.2 mm anti shatter styrene so for those of you with kids running around and kicking balls in the garden, you will be happy to know that the windows will not smash into lots of little pieces. While we like these windows and their placement on the workshop, we do feel that they could have made one or two of them be opening windows. A strong pad bolt is on the doors so the workshop will close securely, but if you do want to add a little security to the workshop so that your belongings are kept safe then you will have to purchase one of their security options. First of all is a Yale hasp and padlock that will set you back a reasonable £19.99. If you want something a little more high tech and cool then they have an electronic shed alarm kit which can be added for £29.99. With the six windows on one side of the workshop, you are probably expecting us to tell you that this is a workshop where you must wear pants at all time. But actually these windows are rather compact in their size and placed as high as they could be, so the workshop is far more private than you would think. 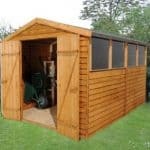 As we have said numerous times, this is a large workshop so even with just a basic, clear wood treatment it is going to be the prominent feature in your garden. 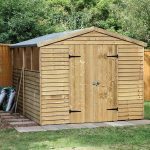 With this in mind, you may want to give the workshop a coating of a wood treatment that is coloured to either make it stand out even more or blend it with the rest of the items you have in your garden. 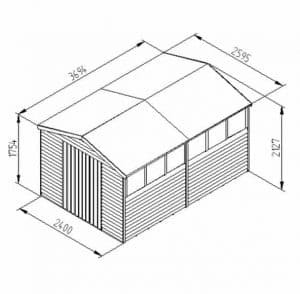 We already talked about the security extras they offer, but they are also offering a plastic shed base. This is very pricy at £239.99, and even though this may be a practical extra for some of you is still something that really does see the overall price of the workshop shoot up. When we see a workshop as large as this, we sometimes worry that a couple of corners will be cut to keep its price low, but that is not the case here. This is very high quality and we are very impressed with the way it has turned out. This is the type of workshop that will require you to look after by giving it a fresh coating of treatment once a year. But in general the materials that have been used are just fantastic and will last for many, many years. You have just a ton of storage space at your disposal here. The only problems you have is deciding how to fill it all up and trying to squeeze it into your garden. Any workshop or shed that is over the 10 foot mark is going to take a little while to build, but we do not see you taking more than 6-8 hours to install this. Just be sure to have a friend to help you out as this is most certainly at least a two person job. For the space you are getting and the overall quality, you are getting a lot of bang for your buck with this workshop. Final Thoughts: The Hartwood 12' x 8' FSC Overlap Apex Workshop is one very impressive looking workshop that is sure to make you and the neighbours say wow once it has been installed. 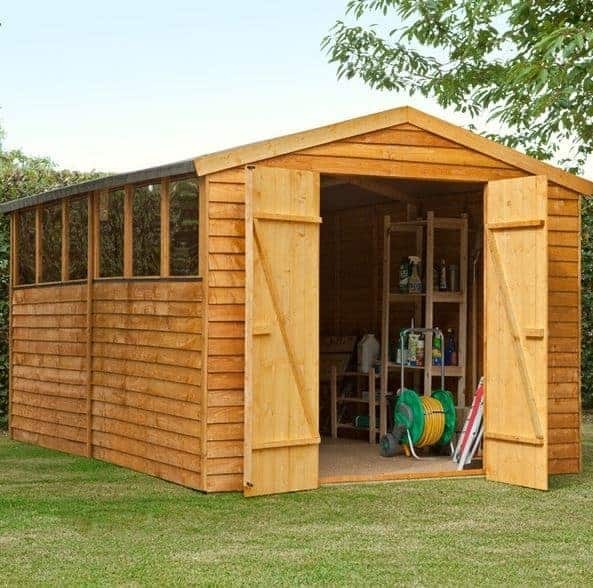 While it is called a workshop and the space it offers would make for one very spacious and comfortable workshop, we feel that if you have lots of tools, gardening equipment or even if you have kids who have a couple of bikes and a bunch of outdoor toys, this would be just perfect as a large storage shed as well. We are very happy with this and if space is what you are after then you are going to be very pleased with this large and good looking workshop.